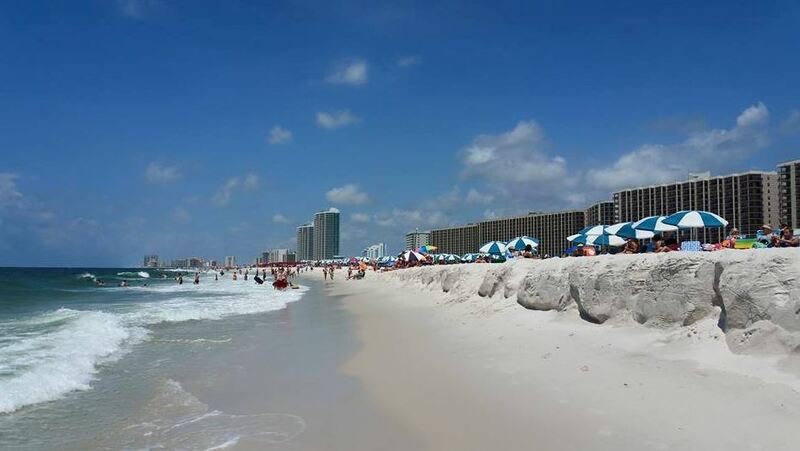 Terri’s Travels: Orange Beach, Alabama … a vacation treasure! Adventure, fun, relaxation … you’ll find it all on Alabama’s sugar sand beaches. For years, Orange Beach and its neighbor Gulf Shores remained a little-known vacation treasure, but more and more families are discovering the 32 miles of soft sand and clear waters that lace the edges of Alabama’s southern border to the Gulf of Mexico. Orange Beach shorelines are some of the finest in the world! Just 670 miles from Dallas, this is a fantastic family beach vacation spot that is often overshadowed by its better known and more crowded neighbors in the Sunshine State. I think it’s time everyone knows about Alabama’s beautiful Orange Beach. This vacationland offers a little bit of everything! There is great boutique shopping, wonderful fine and casual dining, dolphin sitting cruises, sailing trips, festivals, free concerts, championship golf courses, and world class deep-sea fishing. In fact, this is home to the country’s largest artificial fishing reef. While fishing or enjoying a variety of other water sports guests can enjoy spectacular views of the beautiful Gulf of Mexico and scenic back bays. Located on the shores of the Gulf of Mexico, Orange Beach offers endless views of sugar-white sand beaches and access to the interior bays lying just north of Perdido Pass. Visitors can also enjoy a lengthy list of nice attractions for all ages. One unique option is just down the road to historic Fort Morgan, the guardian of Mobile Bay since 1834 where four wars were fought. Now that’s an exciting history lesson! After a day of fun Orange Beach adventures, refuel with outstanding seafood that doesn’t get any fresher than right off the boat. My favorite restaurants are Voyagers, Tacky Jacks and Fisher’s at Orange Beach Marina. These all have outstanding freshly caught seafood, southern cuisine, wine, cocktails and great waterfront views. Originally named after the orchards of orange trees that once grew there, OrangeBeach is perhaps now best known for the largest charter fishing fleet along the entire Gulf Coast. It’s continuing to earn a premier reputation as a destination for those seeking the ultimate Gulf Coast experience. It’s all waiting to be discovered! As a special treat and side note, I have a unique recipe from Orange Beach that my friends and I loved. This “Sand Mountain Tomato Tart” was selected as the Alabama “Dish of the Year” and will always be a staple on the menu at Voyagers Restaurant. Prepare tomatoes – Blanch, peel and core tomatoes. Mix maple syrup, balsamic vinegar and salt and pepper in a shallow dish large enough to hold the tomatoes. Place the peeled tomatoes in the maple syrup and balsamic mixture, core side down. Bake at 325 degrees for 10 to 15 minutes. Prepare pastry crust – Flatten thawed puff pastry dough on work surface. Use a 3.5-inch pastry/biscuit cutter to make 6 puff pastry discs. Place discs on a parchment lined pan, place a cooling rack over discs (to prevent excessive rise) and bake 350 degrees for 15 minutes until light golden brown. Caramelize onions in olive oil over medium-high heat. To assemble tarts – Flip tomatoes, core side up, but leave in dish. Divide onions and cheese evenly on top of each tomato. Return to oven for 3-5 minutes. Place one cooled puff pastry disc on top of one warmed tomato and using tongs flip the tomato tart so that the pastry is on the bottom. Repeat for each tart. Sprinkle with fresh basil.